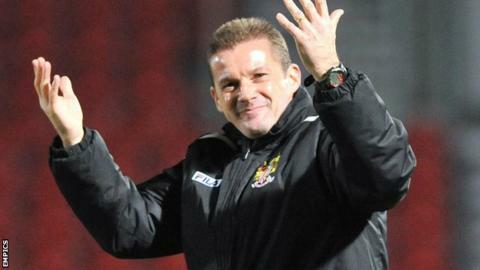 Stevenage boss Graham Westley has said relegation from League One was an inevitability. Boro's drop to League Two after three seasons in the third tier was confirmed on Monday with defeat by Bristol City. "This week has almost been a relief in that I knew it was coming for so long," Westley told BBC Three Counties Radio. "In my gut I've probably been living with the fact that whatever I do I haven't been able to get the response from the players." Westley returned to Broadhall Way for his third spell in charge at the back end of the 2012-13 season, taking over from Gary Smith. "Anyone who knew me last summer will know I was worried about what I had inherited here. I was probably thinking relegation was a distinct possibility," he said. "I knew what I was looking at. I was experienced enough to know what was in front of me. The results spoke for themselves when I came back. "I made it clear that I thought a mass culling was required. We weren't able to do that. "I was trying everything I knew and more to get results." Westley took Stevenage into League One for the first time in their history three years ago with back-to-back promotions but left for a 13-month spell at Preston. Next season will be the first time he has managed in League Two since the 2010-11 campaign. "We can leave the past behind now. Clubs go through transitions and you have to be brave enough to follow that through," he said. "I think we're in good shape now to build on solid foundations."